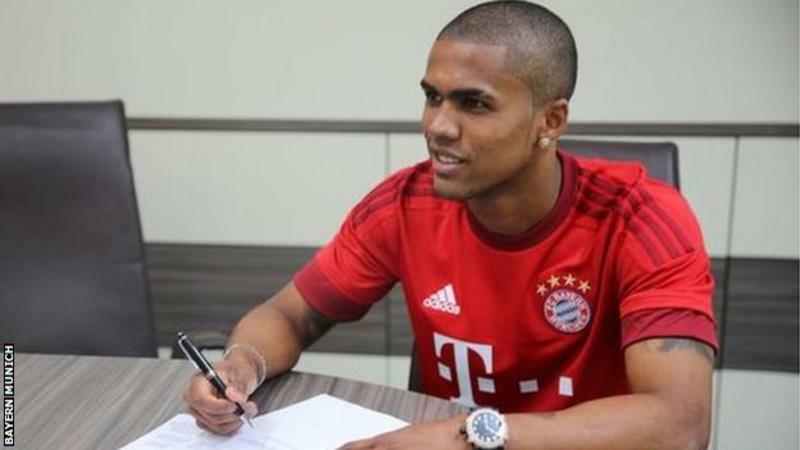 Did you know Manchester United are “willing” to splurge £79m on Douglas Costa, the Bayern Munich forward? The BBC says they are. That’s a lot of money for a player Bayern farmed out on loan to Juventus last season. When Costa joined the Italians on a season-long loan last July, terms of the deal were written across the newswires. Juventus would pay Bayern €6m (£5.3m). There was an additional €1m (£885,000) in performance-related add-ons. Crucially, there was an option to buy Costa outright for a further €40m (£35.4m). So Costa would cost Juventus around £40m were they to sign up. But Manchester United are “willing” to pay £79m for the same player. Really? Over in the Sun Manchester United are “ready” to pay £79million for Costa. 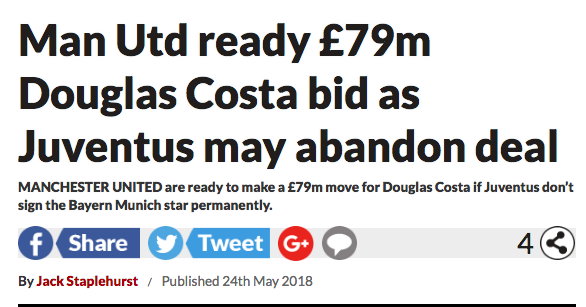 In the insane world of football transfers – and the twilight world of football reporting – Juventus would buy Costa for £40m and the next day be able to sell him to Manchester United for double that. Agree to give Costa two signing-on fees, and the Brazilian and his agent are happy. The tin lid is places on this absurd story when the Sun tells its readers :”Presently, the chances of Costa ending up at Old Trafford stand at 40 per cent.” Says who? Dunno. The Sun doesn’t bother to show us the maths. But it works at 1% for every million a desperate United will are ready and willing to pay over the odds to get their man. Daily Star: Costa to Chelsea. It was Costa’s “dream move”. “I’ve realised a dream,:” said Costa when he signed for Bayern Munich for £21m.